Derrick Jabar Gaffney (born December 1, 1980) is an American former college and professional football player who was a wide receiver in the National Football League (NFL) for eleven seasons. He played college football for the University of Florida, and was recognized as a consensus All-American. He was drafted by the Houston Texans in the second round of the 2002 NFL Draft, and also played for the New England Patriots, Denver Broncos, Washington Redskins and Miami Dolphins. Gaffney accepted an athletic scholarship to attend the University of Florida in Gainesville, Florida, where he played for coach Steve Spurrier's Florida Gators football team in 2000 and 2001. The Gators coaching staff decided to redshirt him as true freshman in 1999. Gaffney became a prolific pass-catcher as a first-year starter for the Gators in 2000, and made the game-winning touchdown catch with fourteen seconds remaining to defeat the Tennessee Volunteers 27–23—a game that ultimately decided the 2000 winner of the Eastern Division of the Southeastern Conference (SEC). Gaffney amassed 1,184 receiving yards and fourteen touchdown receptions in 2000, and another 1,191 and thirteen touchdowns in 2001. Gaffney was selected with the 1st pick in the 2nd round of the 2002 NFL Draft by the Houston Texans. His tenure with the team was marred by his often inconsistent play which led to his benching in favor of veteran receivers, in particular Corey Bradford. After his rookie contract was up the Texans chose not to re-sign him after he put up less-than stellar stats. On March 16, 2006, the Eagles signed Gaffney to a one-year contract, but released him prior to the start of the regular season. 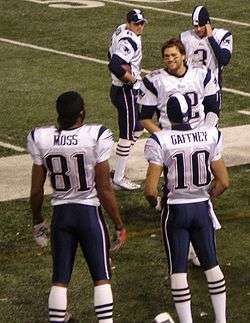 Gaffney signed a two-year deal with the New England Patriots on October 9, 2006. 2007 was his first solid season. On March 5, 2008, Gaffney re-signed with the Patriots for one year worth $2 million. In his first-ever playoff game, on January 7, 2007 against the New York Jets, Gaffney had a near-career day, catching eight passes for 104 yards, his second 100-yard performance as a receiver (in ten regular season games, Gaffney caught 11 passes for 142 yards and one touchdown.) Gaffney followed that performance a week later against San Diego with another 100-yard game, in which he caught ten passes and scored a touchdown. Jabar Gaffney finished the 2008 season with 44 receptions for 468 yards and two touchdowns. His longest reception was 37 yards. His best game came against the Cardinals in week 16, when he had 90 yards receiving. On February 27, 2009, Gaffney signed a four-year, $10 million contract with the Denver Broncos. The deal included $3 million guaranteed. In the Broncos' week 17 loss to Kansas City, he had a career day, catching 14 passes for 213 yards as the Broncos played without Brandon Marshall, who was benched for disciplinary reasons by head coach Josh McDaniels. He finished the 2009 season with 54 receptions for 732 yards and two touchdowns, ranking second on the team in receptions and receiving yards. Gaffney put up 875 yards in 2010. ↑ Pro-Football-Reference.com, Players, Jabar Gaffney. Retrieved March 29, 2011. ↑ databaseFootball.com, Players, Jabar Gaffney. Retrieved March 29, 2011. 1 2 3 4 5 GatorZone.com, Football History, 2001 Roster, Jabar Gaffney. Retrieved March 29, 2011. 1 2 3 4 5 2011 Florida Gators Football Media Guide, University Athletic Association, Gainesville, Florida, pp. 89, 94, 97, 99, 101–103, 158–159, 181 (2011). Retrieved August 29, 2011. ↑ 2012 NCAA Football Records Book, Award Winners, National Collegiate Athletic Association, Indianapolis, Indiana, pp. 11 & 14 (2012). Retrieved September 14, 2012. ↑ Matt Hayes, "Gaffney facing grand theft charge," The Florida Times-Union (February 20, 2000). Retrieved July 12, 2014. ↑ Ray McNulty, "Gaffney to get scholarship," The Florida Times-Union (October 25, 2000). Retrieved July 12, 2014. ↑ Eddie Pells, "Florida's Gaffney won't be charged," The Item, p. 3B (July 4, 2001). Retrieved July 12, 2014. ↑ Jones, Mike (July 27, 2011). "Redskins trade Jeremy Jarmon to Denver for Jabar Gaffney". WashingtonPost.com. Retrieved 2012-07-17. ↑ Barry Sviruga, "Jabar Gaffney sets career high in receiving yards," The Washington Post (December 24, 2011). Retrieved May 1, 2012. ↑ Brian Tinsman, "Roster Review: Wide Receivers," Redskins.com (February 28, 2012). Retrieved May 1, 2012. 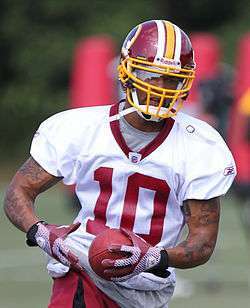 ↑ Mike Jones, "WR Jabar Gaffney says Redskins are shopping him," The Washington Post (April 18, 2012). Retrieved May 1, 2012. ↑ Mark Maske, "Mike Shanahan says Jabar Gaffney could remain with Redskins," The Washington Post (April 25, 2012). Retrieved April 29, 2012. ↑ "Redskins cut Jabar Gaffney," ESPN.com (May 1, 2012). Retrieved May 1, 2012. ↑ "Patriots bring back WR Gaffney," Pro Football Weekly (May 2, 2012). Retrieved May 2, 2012. ↑ Gregg Rosenthal, "Jabar Gafney, Donte Stallworth cut by Patriots," NFL.com (August 27, 2012). Retrieved August 27, 2012. ↑ 'Dolphins sign Jabar Gaffney," ESPN.com (October 2, 2012). Retrieved October 2, 2012. ↑ "Jabar Gaffney Stats". ESPN Internet Ventures. Retrieved 2 April 2014. ↑ New England Patriots, Players, Jabar Gaffney. Retrieved March 29, 2011.